In 2011, an aerial survey of the western coastal calving distribution led to a herd estimate of 124,000 caribou which is a decline of 55% since 1994 (Campbell et al. 2014). The Beverly and Ahiak herds are included together as interpretations about trends differ partially due to monitoring gaps (Adamczewski et al. 2015, Nagy et al. 2011). Caribou numbers on the Beverly inland calving ground declined from 276,000 in 1994 to <100 by 2009 (Gunn et al. 2013; BQCMB 2014, Campbell et al. 2014). Ecology: The calving ground is along the Queen Maud coast and the post-calving and summer ranges are within the Queen Maud Gulf Migratory Bird Sanctuary, Nunavut (NPC 2016, Gunn et al. 2013). Prior to 2008, an inland calving ground south of Garry Lakes was used by the then Beverly herd which summered south with fall and winter ranges within the boreal forests. The fall and spring migration is west toward and south through the Thelon Game Sanctuary. Since 2012, the winter range has contracted to the tundra in NWT and NU. In the 1990s and 2000s, the herd wintered in the boreal forest as far south as Saskatchewan border where hunters from Black Lake, Stony Rapids and Uranium City as well as Fort Smith and Lutsel K’e harvested the caribou. The tundra ranges are mostly remote from communities and industrial development although mineral exploration increased 2005-2009 on the previously used inland calving grounds (BQCMB 2014). Climate: The climate is continental with warmer, drier summers and colder winters. Toward the interior, the pre-2008 Beverly calving ground was cool with fewer plant Growing Degree Days in early June but by July, the summer ranges were characterised by a high number of plant Growing Degree Days along with higher drought and oestrid indices. The coastal calving and summer ranges are cooler in June and July. Significant trends include an increasing July drought and warmer temperatures in October. Monitoring: Monitoring of late winter calf cow ratios has been irregular since the 1980s and the ratios while annually variable have exceeded the 30 calves: 100 cows (for a stable or increasing herd) except for low ratios 2006-8 (BQCMB 2014). Productivity, as indexed by calf:cow ratios on the inland calving ground, declined between 1988 and 2009 (Adamczewski et al. 2015). In the late 1980s, intensive monitoring established age-specific pregnancy and survival rates related to annual variation in body condition (Thomas et al. 1990). Survival increased progressively from about 89% between ages 2 to 4 years of age, to 78% between age 10 and 11 years of age during the time when the herd was stable in numbers. In 2007-2009, annual survival of satellite-collared cows with at least 1 year of calving on the inland calving grounds, survival was low at 58% (CI = 42-72%) compared to 79% survival rate of cows calving on the coast (Adamczewski et al. 2015). Trends in harvest information are not reported. Management: Given the extent of the disagreement about whether or not the Beverly herd collapsed before it shifted to calve along the Queen Maud coast inhibits describing either the rate or the mechanisms for the decline. The annual range is within Saskatchewan, Northwest Territories and Nunavut. The Beverly Qamanirjuaq Caribou Management Board (established in 1982) advises governments and communities on conservation and management. The BQCMB has a series of management plans (BQCMB 2014) while both territorial governments have territory-wide caribou management strategies. Lack of harvest information is identified as a key management issue (BQCMB 2014). The Nunavut Planning Commission is (2016) drafting land use planning which includes zoning and proposed mitigation for caribou seasonal ranges. Adamczewski, J., A. Gunn, J. Nishi, K. Poole, and J. Boulanger. 2015. What happened to the Beverly caribou herd after 1994? Arctic 68:407-421. Campbell, M., D.S. Lee, J. Boulanger, A. Kelly M. Dumond. and J. McPherson. 2014. Calving ground abundance estimates of the Beverly and Ahiak subpopulations of barren-ground caribou (Rangifer tarandus groenlandicus) – June 2011. Technical Report Series – No: 01-2013, Government of Nunavut. 193 pp. Gunn, A., K.G. Poole, J. Wierzchowski, J.S. Nishi, J. Adamczewski, D. Russell, and A. D’Hont. 2013. 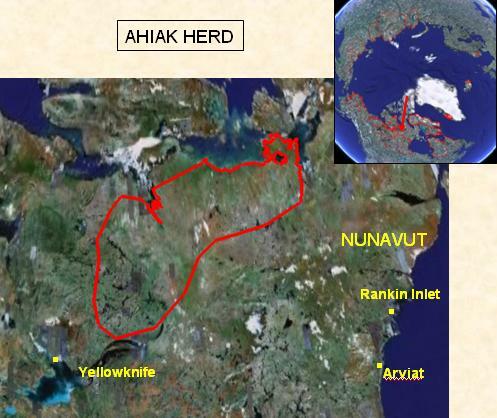 Have geographical influences and changing abundance led to subpopulation structure in the Ahiak caribou herd, Nunavut, Canada? Rangifer 33, Special Issue No. 21:35-58. Nagy, J.A., D.L. Johnson, N.C. Larter, M.W. Campbell, A.E. Derocher, A. Kelly, M. Dumond, D. Allaire, and B. Croft. 2011. Subpopulation structure of caribou (Rangifer tarandus L.) in Arctic and sub Arctic Canada. Ecological Applications 21:2334–2348. Thomas, D.C., and S.J. Barry. 1990a. Age-specific fecundity of the Beverly herd of barren-ground caribou. Rangifer, Special Issue 3:257–263.